The remarkable video and photos shot by David Redfield, a professor emeritus of FSU's science education faculty, and Thai wildlife biologist Uthai Treesucon are being hailed as historic images documenting a true "living fossil," the Laotian rock rat. 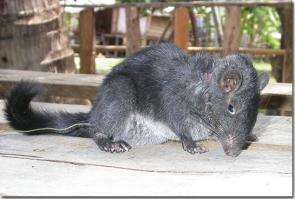 The Laotian rock rat is so called for its only known habitat - limestone outcroppings in Central Laos - and the appearance of the animal's head and face, which sport long whiskers and beady eyes like those of a rat. Redfield's video shows a docile, squirrel-sized animal covered with dark, dense fur and bearing a long tail that's not as bushy as that of a typical squirrel. Perhaps the most striking observation is how the animal walks - like a duck. Clearly not adapted to climbing trees, the rock rat exhibits a duck-like waddle with its hind feet splayed out at an angle to its body. An avid but otherwise amateur wildlife observer, Redfield has traveled the world since retiring in 1988 from a career in teaching and research at FSU. A passion for bird watching in the 1990s segued into an interest in seeing some of the world's rare mammals in their native habitats. When he learned about the discovery of the Laotian rock rat last year - and that no one had seen a live specimen - Redfield set out on a personal quest to accomplish the feat. "We were extremely fortunate in so many ways to be able to do this," Redfield said of the discovery. "It's easily one of the most gratifying experiences of my life, and I hope these pictures will help in some way to prevent the loss of this marvelous animal." Known as kha-nyou (pronounced "ga-noo") in Lao villages near its habitat, the animal was first described scientifically in the April 2005 issue of the journal Systematics and Biodiversity. Identified as a member of an entirely new family of mammals, the rock rat made news around the world. It gained international attention again on March 10 of this year when scientists published a paper in Science magazine re-identifying the animal as a "living fossil" whose last remaining relatives went extinct 11 million years ago. Mary Dawson, curator emeritus of vertebrate paleontology at the Carnegie Museum and primary author of the paper published in March in Science, recently reviewed Redfield's images and confirmed their authenticity. "This is a truly exciting discovery," Dawson said. "Dr. Redfield's sighting of the living animal is the first to be recorded scientifically. These are the first photographic images of the recently discovered 'living fossil' Laonastes aenigmamus." Dawson led the team of scientists who used fossilized remains collected from sites in Pakistan, India, Thailand, China and Japan to prove that, instead of being completely new to science, the rare animal actually was the last known relative of a long-extinct family of rodents known as Diatomyidae. Dawson's paper described the rock rat as an example of the "Lazarus effect," a reference to the Biblical character Lazarus who returned from the dead. Biologists use the term to refer to those rare instances when animals long thought to be extinct turn up alive and well in some remote habitat. "Dr. Redfield's discovery and these images are extremely important scientifically, showing as they do an animal (with) such markedly distinctive anatomical and functional attributes," Dawson said. "These are amazing pictures." Redfield used some of his contacts in Southeast Asia - made from numerous bird-watching field trips to the region over the years - to help coordinate his trip to Laos this past May. Using native guides and interpreters, he succeeded in gaining the confidence of local hunters near a Central Laotian village close to the Thai border. After four failed attempts, the hunters finally captured a live rock rat. Redfield and his hosts returned the animal safely to its rocky home after photographing and videotaping it.